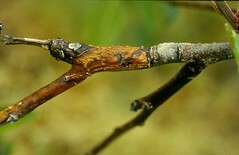 Nectria twig blight is a fungus disease that results in dieback of apple twigs. It is caused by the fungus Nectria cinnabarina. Recognition of the disease is important because the disease is often confused with fire blight, which requires different control measures. 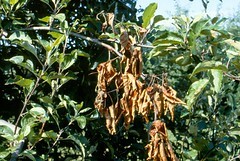 In late May to early June, shoot growth on infected twigs begins to wilt and die (fig. 1). Small, sunken cankers are found at the bases of the wilted shoots. Leaves on infected shoots appear to die from the base, not from the tip, as with fire blight, and no signs of blighted blossom clusters remain on the twigs. Shoot death may be extensive (fig. 2). In mid to late summer, bright orange or coral-red structures (sporodochia), 1/8 inch to 1/6 inch in diameter, appear on the surface of the cankers (fig. 3). Orange sporodochia also are associated with pruning wounds and winter-injured tissues on apple. In autumn, the fungus produces clusters of small, dark red, globular perithecia, but these structures rarely are present in the eastern United States. Figure 1. Early symptoms of Nectria twig blight resemble fire blight. Photo: Alan R. Biggs, West Virginia University. Figure 2. 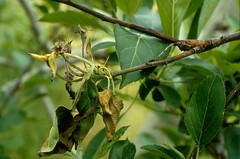 Shoot dieback of 'Rome Beauty' apple in early June due to Nectria twig blight. Photo: Alan R. Biggs, West Virginia University. Figure 3. Close-up view of previous year's fruit node killed by the Nectria twig blight fungus. Photo: Alan R. Biggs, West Virginia University. Optimum fungal growth occurs in culture at 70°F, with moderate growth at 80°F to 85°F and limited growth at 37°F. Wounds from fruit harvest, which probably take a long time to heal late in the season, combined with prolonged periods of wet weather after harvest, appear to favor the establishment of infection. The disease has been noted primarily on cultivars with a large cluster-bud base, such as 'Rome Beauty', 'Ben Davis', and 'Northern Spy'. The disease is not usually severe enough to require special control measures. As a result, chemical control procedures have not been developed. Removal of infected twigs helps reduce the carryover of inoculum but may not significantly reduce disease incidence. Original text prepared by A. L. Jones and T. B. Sutton.